This e-book describes the change tracking framework for Microsoft SQL Server. 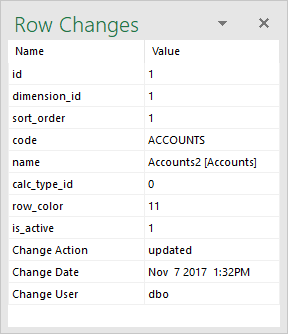 You may add change tracking features to a database and track changes using SSMS or Microsoft Excel. 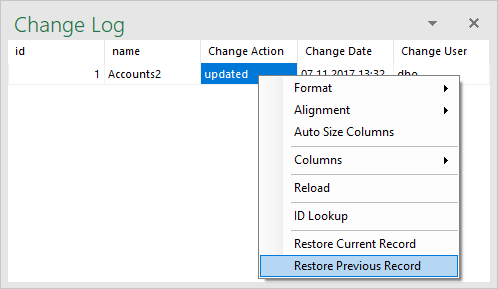 Also, you may extend the Microsoft Excel context menu to allow business users to track and rollback changes. The change tracking framework provides features that track DML changes (insert, update, and delete operations) in a database. Create and drop change tracking triggers. Create and drop procedures to select changes. 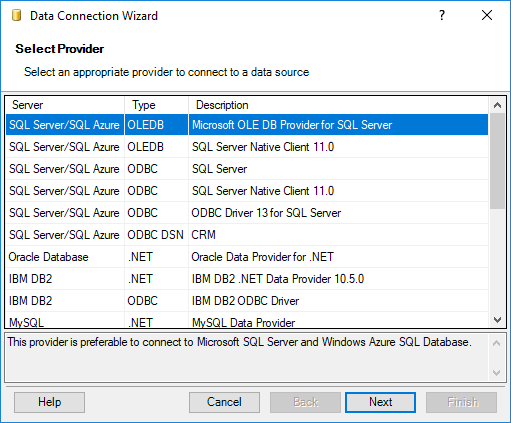 You may execute the operations in SSMS, your application, or in Microsoft Excel using the SaveToDB add-in. 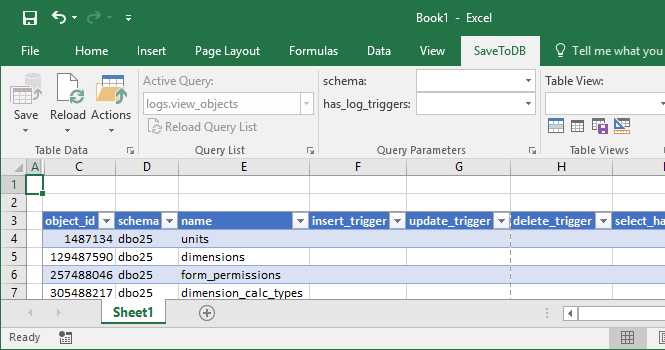 Moreover, you may easily extend Excel context menu to track changes in Excel. Configuration objects to track and restore changes in Microsoft Excel for end users. You may download and install the framework in a couple of minutes. 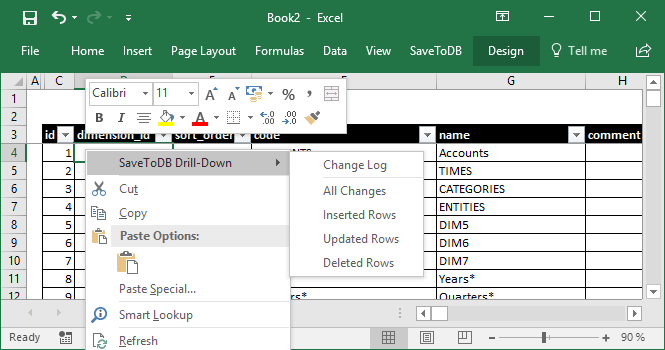 The framework uses features of the SaveToDB Express add-in for Microsoft Excel. So, you may use it for free. To see historical data in Microsoft SQL Express (not supported by the Change Data Capture feature). To easily integrate and use the solution in Microsoft Excel (not supported by SQL Server). To allow business users to manage change tracking features and rollback changes using Microsoft Excel. We get a reliable and high-performance solution that you may use for free. Try the framework. You may save a lot of time and make your users happier. You may download the change tracking framework at https://www.savetodb.com/download.htm. The application also requires SaveToDB 7.14 or higher. You may download the add-in here too. Unzip the downloaded package to a local drive. To uninstall the framework, open and execute the change-tracking-framework-remove.sql script. Note that the script removes frameworks objects, created change tracking triggers and procedures. You may use Microsoft Excel to manage change tracking framework objects. Select cell B3 to insert a table and click OK. The framework creates three triggers to log INSERT, UPDATE, and DELETE operations for captured tables. Check the target table and click OK. The change tracking framework also creates a stored procedure to select changes. Note that the framework creates procedures in the schemas of underlying tables. So, if a user has SELECT and EXECUTE permissions for a schema, he can execute a new procedure. 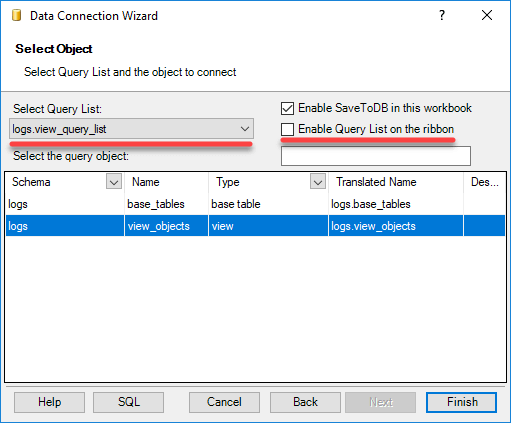 The framework configures such procedures as SaveToDB context menu items for underlying tables. The framework configures procedures to show changes as SaveToDB context menu items for underlying tables. 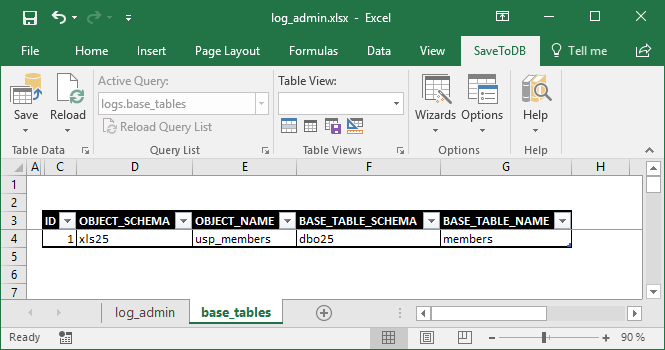 To attach context menu items to other objects, edit the link data in the logs.base_tables table. You may do this in Excel. Just connect to the table, edit the data and click the Save button. In this example, we have attached dbo25.members context menu items to the xls25.usp_members procedure. 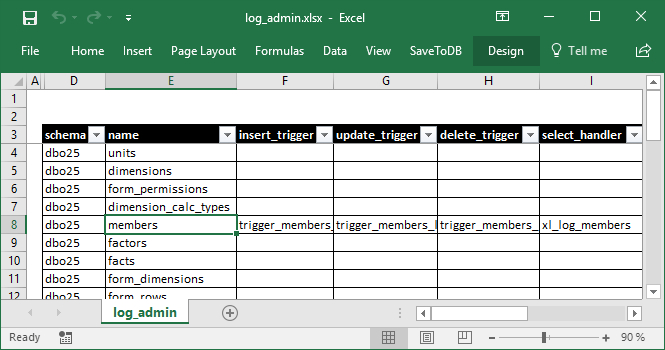 As a result, users may track changes using the context menu of the xls25.usp_members procedure. They need click Reload, Reload Data and Configuration to load new context menu items. Note that the target object must select all primary key fields of the base table with the same names. Click Reload, Reload Data and Configuration to refresh the context menu after creating the procedures. Let&apos;s change the name of the Accounts member and save the changes. You may see old values in square brackets. You may restore the current or previous version of the active row. In this example, we want to restore the previous name. So, choose the previous record. 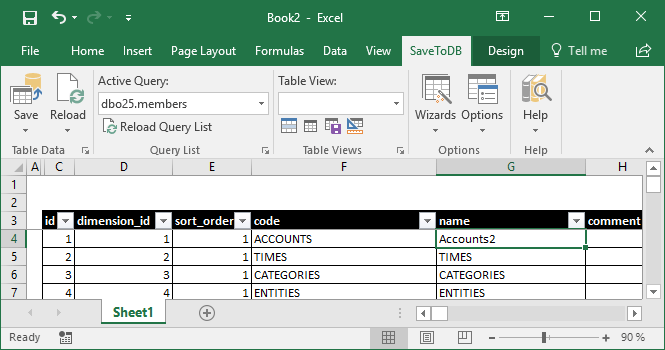 The task pane shows table rows as is. 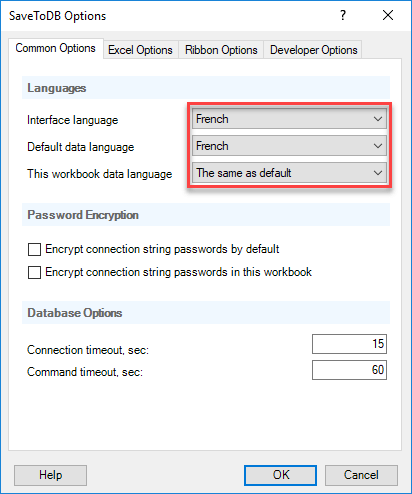 Use the ID Lookup context menu item to find the related row in the foreign key table. 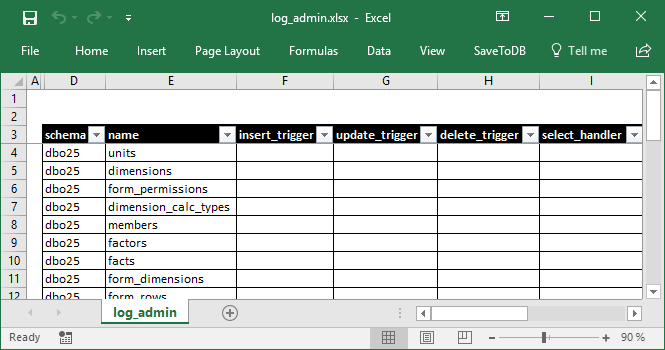 To apply changes, click Reload, Reload Data and Configuration and restart Excel. 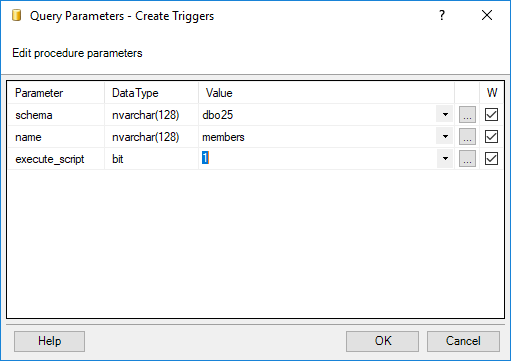 To create and drop triggers, users must also have such permissions in the target schema. To clear logs, users must also have UPDATE permissions on the captured tables. You may find log_administrators permissions in the logs.usp_set_role_permissions_administrators procedure. Restore records from the log. To select log records, users must also have SELECT permissions on the captured tables. To restore records, the user must also have UPDATE permissions on the captured tables. You may find log_users permissions in the logs.usp_set_role_permissions_users procedure. Assign this role to users who can create triggers, drop triggers and clear logs. See actual database permissions in the logs.usp_set_role_permissions_administrators procedure. Assign this role to business users who will use the change tracking functions. See actual database permissions in the logs.usp_set_role_permissions_users procedure. The change tracking framework creates its objects in the logs schema. This application table contains change tracking data for all captured tables. Do not edit it. This application table contains column translation data. You may change and add translations. This application table contains event handler configuration. The framework inserts and deletes handlers of every captured table here. This application table contains object translation data. You may change and add translations. This view selects column translation configuration for the SaveToDB add-in. This view selects event handler configuration for the SaveToDB add-in. This view selects object translation configuration for the SaveToDB add-in. Use it to configure change tracking triggers. See Setup. 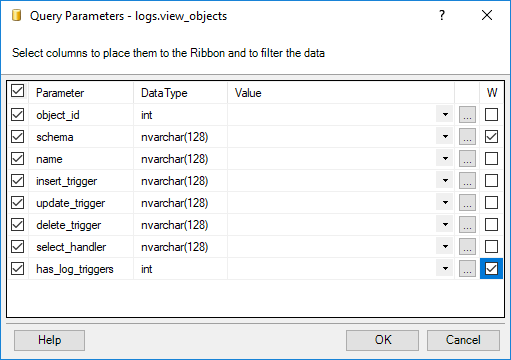 This view selects change tracking framework objects to connect with Microsoft Excel. This procedure restores the current version of the change log record. 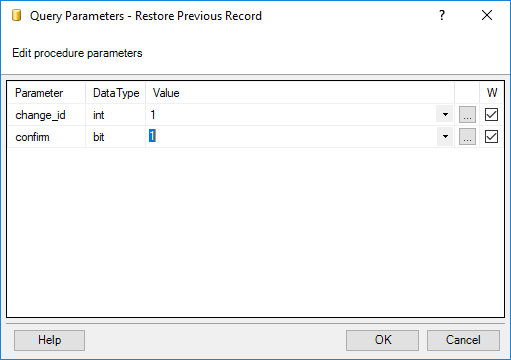 The procedure executes the usp_restore_record procedure with the predefined parameter. This procedure restores the previous version of the change log record. This procedure restores a row from the change log record. This procedure selects change details of a change log record. This procedure selects change log records. 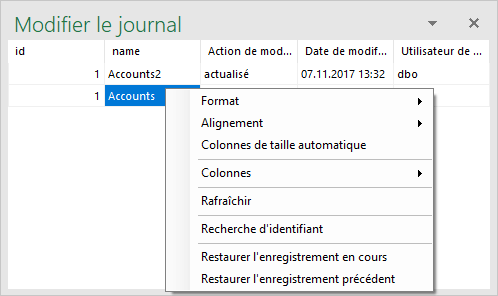 This procedure sets permissions for the log_administrators role. See Administrator Permissions. This procedure sets permissions for the log_users role. See User Permissions. Below are the trigger examples. All triggers of all tables add new change tracking records to the single logs.change_logs table. If a table has an identity field, the triggers use this field. This is the fastest case to track and select changes. Otherwise, the triggers pack the key field values into XML. The maximum length is 445 characters. You cannot use the framework for tables with larger key lengths. Triggers pack inserted and deleted values into XML. Also, triggers save the time and user of the changes. Install the change tracking framework. Create triggers for captured tables. You may repeat these steps for any database in a couple of minutes. However, you get a reliable and high-performance solution. For free. 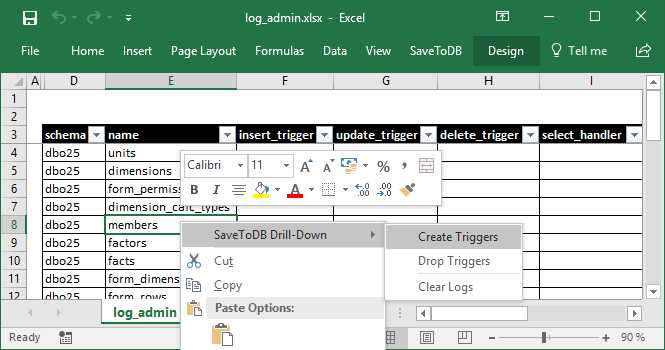 Moreover, you get the possibility to work with logs in Microsoft Excel using the free SaveToDB Express add-in. And, you may extend your existing Microsoft Excel application to allow users track changes and restore records. I hope you try it and will like it.